While writing this review, I looked back to see when I first used a Pro Solo. It came as a shock to discover that it was more than a decade ago, since when countless numbers of these chunky little boxes have been getting on with their jobs, connecting vintage monosynths to the MIDI studios of the modern world. After its launch, Kenton upgraded the product's firmware on numerous occasions. They added Auto sync, extended the note range, added All Notes Off, and provided additional clock divide ratios to extend the number of analogue drum machines that the Pro Solo could sync to MIDI. Nonetheless, it was not without its faults; its method for showing numbers above 99 was clumsy and, on a practical level, its ability to produce just CV, Gate and a single auxiliary voltage was a bit limiting at times. 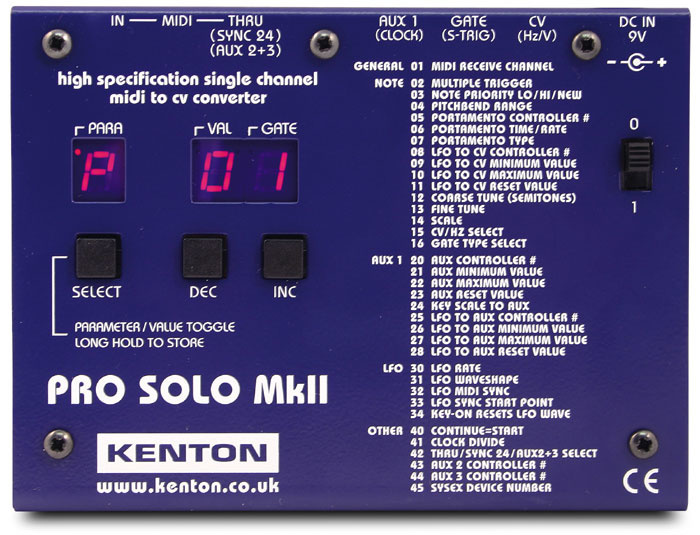 So it's great to see that Kenton have relaunched the Pro Solo in a new, smart livery, with enhanced Aux and LFO capabilities and an improved user interface. Enter the Pro Solo MkII. The original Pro Solo was designed around three buttons (Select, Dec and Inc) plus single-character and dual-character seven-segment displays. It offered 20 parameters identified as 0 to 9 and A to J, as shown in the box opposite. The MkII version looks similar, but has an enhanced set of options, with 36 parameters labelled in groups from 01 to 45, which you can see reproduced on the front panel in the picture above (or in full in the box overleaf if you'd rather not squint too much). The MkII also has a much nicer user interface. On the earlier model, you pressed the Select button to scroll through the menu, with the parameter identity displayed in the single-character display and its value in the dual-character display. To change direction, you had to hold the Select button for two seconds and then continue to press it to move between parameters in the other direction. On the MkII, the Select button toggles between showing the parameter number in the dual-character display and the parameter value in the same display, and you can then scroll up or down either using the Inc and Dec buttons. This is much nicer. 5 LFO to CV controller number. 6 LFO to Aux controller. Likewise, the way that parameter values above 99 are displayed on the MkII is greatly improved. In the past, '_n' denoted values from 100 to 109, '­nn' denoted values from 110 to 119, and '¯nn' from 120 to 127. On the MkII, the single-character display shows a '1' (for one hundred) when appropriate. In the grand scheme of things, this is a small difference, but it makes the MkII more pleasant to use. Once you've configured the Pro Solo MkII as you want it, you can press and hold the Select button for six seconds and the current configuration is stored in the unit's non-volatile EPROM. If you get it wrong, you can restore the defaults by switching the unit off and then holding down the three buttons while switching it on again. Round the back (shown overleaf), the Pro Solo offers six sockets. The MIDI In and the input for a standard 9V power supply are self-explanatory. In contrast, and depending upon the parameter values selected, the CV out offers Volt-per-octave and Hertz-per-Volt control voltages, the Gate also provides S-Trig, the Aux can carry a clock, and the MIDI Thru doubles (triples?) as a Sync24 output or carries Aux2 and Aux3 signals. The parameter menu suggests that the Pro Solo MkII is much more than a simple converter, and so it is. In addition to parameters that allow you to configure its operation for multiple playing styles (trigger mode, note priority and so on) and to allocate MIDI controllers so that the analogue beastie at the far end jumps through the hoops you want, it offers a comprehensive LFO, portamento, MIDI Sync, three auxiliary controllers, and SysEx. Starting with the LFO, this offers nine waveshapes (including Sample & Hold) with a user-defined frequency or 10 values of MIDI Sync, and you can control the depth of the effect applied to the CV using controllers such as pitch-bend, aftertouch, velocity, and MIDI continuous controllers (CCs). In addition, you can define the point in its cycle at which the LFO is retriggered, and three additional parameters allow you to determine the maximum and minimum values of the LFO applied to the pitch CV, and the amount of LFO applied after a reset. Portamento is also provided so that you can create glides on analogue synths that don't have this, but its functionality is expanded over that of the original Pro Solo by the addition of Fixed Rate and Fixed Time options. These determine whether you define the time taken to move across a given interval, or the time taken to slew from one note to the next, irrespective of the interval concerned. The original Pro Solo offered an Auxiliary CV, which could be determined from any of 125 MIDI controllers and CCs, with user-definable maximum, minimum, and reset values. You could then choose from 123 MIDI controllers and CCs to determine how much of the internal LFO was applied to the Aux CV. This made the auxiliary extremely flexible; for example, you could use a modulation wheel to determine the unaffected CV and then use aftertouch to apply the LFO, thus modulating the Aux CV before routing it to the destination of your choice on the analogue synth. To all of this, the Pro Solo MkII adds key scaling and the now ubiquitous minimum, maximum and reset values of the LFO applied to the auxiliary CV. The most obvious application for the new parameters is to open and modulate a filter when playing up the keyboard, but this is only one of many possible uses if you have a modular synth. The rear panel may look extraordinarily simple, but there's more to the three plain-looking jack sockets than meets the eye — they're capable of outputting control voltages in a bewildering variety of formats. Even the MIDI Thru can carry Sync 24 or Aux signals as well as MIDI.Other new facilities include the ability to translate MIDI Clock into a stream of pulses so that you can drive arpeggiators and drum machines of various ppqn standards (pulses per quarter note). More radically, you can use the MIDI Thru socket as either a Sync 24 output or for two further auxiliary CVs derived from pins 1 and 3. Don't get too excited... Aux2 and Aux3 are not continuous controllers, and can assume just two values, 0V and +5V, but Kenton added them so that users could control the accent and slide inputs on modified TB303s. Although you need a suitable cable to use Aux2 and Aux3, I have no doubt that many other uses will be found for them. The Pro Solo MkII also responds to SysEx. You can define a device number, and the clear manual gives explicit information about the data structure used. I can't see many people using this, but if you want to ensure that only the analogue synth being controlled by the MIDI-CV converter responds to certain messages, this might be a suitable way to achieve this. Finally, in addition to its use as a converter, the Pro Solo MkII offers a MIDI analysis mode. It's a bit arcane, but if you have no other way to check that the correct MIDI signals are flying around, it's a useful tool to have to hand. There's not much to say other than that it works, and that with a bit of practice it's not hard to use. 08 LFO to CV controller number. 09 LFO to CV minimum value. 10 LFO to CV maximum value. 11 LFO to CV reset value. 24 Key scale to Aux. 25 LFO to Aux controller number. 26 LFO to Aux minimum value. 27 LFO to Aux maximum value. 28 LFO to Aux reset value. 33 LFO sync start point. 34 Key On resets LFO wave. If you are controlling a single synth and the combination of pitch CV, Gate, an Aux CV, and two additional Gate/pulse outputs is sufficient (which it should be), the Pro Solo MkII is a neat solution. It performs with minimal hassle, converts MIDI notes to CVs accurately and, to my ears, responds rapidly. Furthermore, the extra functions are well chosen, and they all add to its usefulness. To illustrate this, consider the Minimoog, which lacks a dedicated LFO, and has neither pressure or velocity sensitivity. With the Pro Solo MkII in Volt-per-octave and S-Trig modes, you can use Kenton's LFO to free up Oscillator 3 from modulation duties, use the LFO to CV controller parameters to make the Minimoog pressure-sensitive, and route the auxiliary CV to the synth's VCA input to make it velocity-sensitive. In addition, the Pro Solo recognises sustain pedal messages for legato playing, and its note buffer makes it possible to trill and smooth uneven arpeggios. If all of that isn't worth a few quid, I don't know what is. Ah yes... the price. In 1995, the Pro Solo was slated to cost a psychologically pleasing £99, but Kenton found that a cheap DAC wasn't accurate enough to meet its standards. Consequently, a higher-spec device was used, and this increased the price by £20. In my view, this was a wise decision; £119 for a good converter was money well spent, whereas £99 for something unsatisfactory would have been a waste. Today, the Pro Solo MkII retails for £109 (although this does not include the 9V PSU) and, given that this is a better product for a price equivalent to no more than £80 a decade ago, it represents excellent value. I like things that not only do what they promise, but do it well with a minimum of fuss. In these days of computer-based packages of code that hang, freeze, or wibble at the slightest excuse, trouble-free operation has become something of a luxury. OK, I accept that you wouldn't expect much hassle from a single-channel MIDI-to-CV converter, but even here there's room for poor operation, dodgy menu structures and crashes. Happily, this review — in which I cross-tested the Pro Solo MkII with a Roland Alpha Juno 2 and a Korg T2EX at one end, and a Roland SH101 and an ARP Odyssey at the other — passed faultlessly. I like it. Well built, compact, and robust. Stable and accurate MIDI-to-CV conversion. A straightforward and clear user interface. A straightforward and clear manual. The original Pro Solo was a good choice for anyone who required MIDI-to-CV facilities for a limited number of analogue synths: that is, just one at a time. The Pro Solo MkII is better thought-out, better featured and, for fewer of your quids, it's an even better choice. Kenton Electronics +44 (0)20 8544 9200.